It was a simple dish that I cooked for my weekend lunch. Not many ingredients were used, but the taste was so good that I am going to make it again very soon. Besides, it took me only 10mins to complete this dish. I used only 1/2 cup of cooked rice ( obviously 1 serving ), some mixed veggies (frozen), an egg and finally a small amount of salted fish. 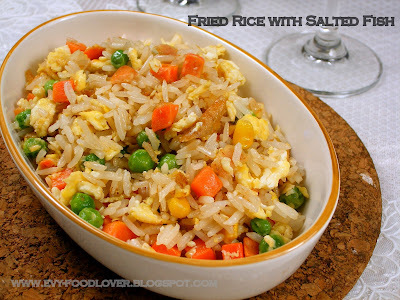 The best thing about the dish is the salted fish, which make the fried rice even tastier than ever. My simple preparation steps as follows: First, cut the fish into small pieces (sorry I cant remember the exact weight of the fish that I've used). Then heat a table spoon of oil in wok and fry those fish till fragrant. Then add mix veggie and stir fry it for about 2 min with the lid on. Next, add the egg and continue to fry until they are fully cooked (about 1 min). Finally add in rice together with 1/2 Tbsp of light soy sauce as well as 1/2 tsp of seasoning powder and fry for about another 2 mins. Dish out and ready to serve. so deliciouas and tempting recipes.I liked your blog..Happy to follow you.Do visit my blog in your free time. Hi All, Thanks much for your kind compliments. Love it. :-). Have a nice day! WOW! Looks so yummy and colourful. Love it! Your fried rice look so yummy! This is always fav fried rice and a typical plate of salted fish fried rice is usually AUD$10 per serve because salted fish is very expensive in Melbourne.